- The JAMAA extends congratulations to the March 2002 testing group for doing an outstanding job during their belt rank examinations! The task was not easy, and the drills were demanding. However, the five young warriors that were present overcame fear, fatigue, frustration, and fierce fighting... to emerge triumphant! Brandon Boyd, from the evening training group, Nathanial Brown, Charlie Smith, Konner Klingenberg, and Andrew Knowles. All their new certificates are on display on the "Page of Fame" link! Congratulations guys on a JOB WELL DONE! - On Saturday, May 25, there will be a martial arts demonstration and seminar which will focus on elements of Tang Soo Do (Korean Karate) and other traditional Korean arts. Presenters in this seminar will be Tang Soo Do masters Melissa Paone and John Hancock. The event will take place in Raleigh, NC from 8am to 6pm. The cost to attend the seminars is $50.00, and arrangements can be made for lodging. For more information, please see sensei Greg Suddreth, or contact Tang Soo Do Instructor Jonathan Plyler at (704) 483-4419. - On Friday, May 31 thru Sunday, June 2, there will be a martial arts training camp taking place in Asheville, NC. A variety of martial arts subjects will be covered during this three-day training such as advanced drills, techniques, sparring and grappling training, Chinese arts training, weapons training, and much more! Our own sensei Greg Suddreth-Stinson will be a presenter during this event. It will be guaranteed fun and learning for all! Cost for participation is $100.00, and you must be age 14 or older. Arrangements can be made for lodging. For more information please contact sensei Gregory Suddreth-Stinson. - Sensei Greg Suddreth-Stinson was recently commissioned by the administration of Balls Creek Elementary to conduct a women's self-defense clinic for its teachers and bus drivers. The classes took place on Thursday the 21st and 28th of March, and the faculty and staff were encouraged to invite family and friends. Sensei stated that in today's society, personal safety is something that we must all be actively vigilant of. Learning the principles of self-defense and public safety are essential to developing the mental preparation to avoid and/or neutralize potential aggressors. In the classes Sensei instructed on recognizing adverse environments, preventing the occurrence of an attack, and techniques in overcoming larger aggressors. - The staff of the Japanese American Martial Arts Academy proudly announces the availability of the new beginner training supplement video cassette. These tapes include footage of the first 3 Kata, basic strikes, kicks, and blocks. Also included are three basic self defense techniques. These videos have been recorded as a supplement to regular student training. The cost for this video is $10.00 each. For more information, ask your instructor. Your approved suggestions will be added in a timely manner. 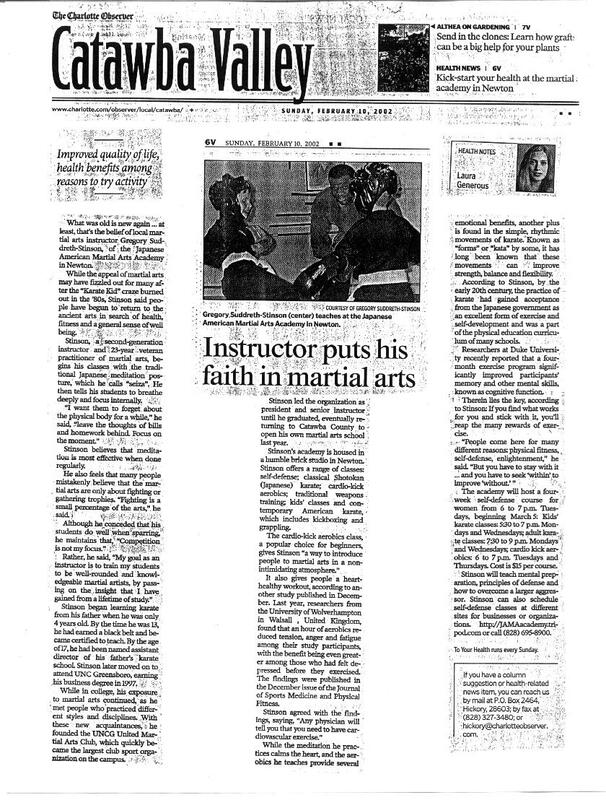 Recently, the Japanese American Martial Arts Academy has been featured in articles of the Catawba Valley insert of the Charlotte Observer. Observer reporter Laura Generous interviewed with Sensei Gregory Suddreth on topics ranging from self defense, physical fitness, self development, and programs hosted by the academy. During her visit, Ms. Generous also took several snap shots of the classes in action. One of these photos appears in the article printed on Sunday, February 10, 2002 in the Health Notes column. Click here to see a readable sized copy of the article. The technique of the month is Age Uke, or "Upward Rising Block". This is one of the four basic block that you will learn in the practice of traditional Karete. In this technique, the blocking hand will begin with the palm of the fist in front of and facing the abdomen. Then, the first will rise upward at 45 degrees, and the first palm facing away from the blocker's body. In application, this block can be used to deflect attacks approaching the neck and head areas. In more advanced practice, this technique can be used as a combination parry and counter-strike to the opponent's body. This concludes our technique of the month.